Todd Waskelis, vice president of AT&T Security Solutions, gives a presentation on how to address cyber threats at the Paul College Cybersecurity Symposium. Kholekile Gwebu and Jing Wang, associate professors of decision sciences in the Peter T. Paul College of Business and Economics, noticed something interesting when they were studying best practices for companies dealing with cybersecurity issues. Gwebu and Wang are connecting their research to help businesses better plan for information security risks. They are learning about the cybersecurity practices and needs of small businesses and offering resources to help businesses meet those needs. Using a grant from Paul College, Gwebu and Wang offered a free symposium for small business owners on Nov. 4 at the University of New Hampshire’s Durham campus. The symposium was designed to raise awareness about cybersecurity risks to small businesses and provide best practices for companies to mitigate these risks. Since the duo's research aims to understand what issues small businesses run into when dealing with cybersecurity, they partnered with two centers in Paul College that focus on small businesses in the region — the New Hampshire Small Business Development Center and the Center for Family Business — who matched them with local small businesses interested in learning more about cybersecurity. “We have always known that small- and medium-sized enterprises (SMEs) face unique challenges when dealing with cybersecurity. Conversations with SMEs at the symposium allowed us to better understand their challenges and derive cybersecurity solutions that are specifically geared toward them,” said Wang. The Center for Family Business connection brought Michelle DuPont, owner of the Lake Opechee Inn and Spa in Laconia, and her business operations manager, Annie Boissoneau, to the event. “It’s pointing us in the right direction and giving us resources we can come back to,” said DuPont. Patrick Brown, owner of Ames Farm Inn in Gilford, said what he learned at the symposium made him feel better about what he can do to mitigate cyber attacks. That’s why one of the three symposium speakers was Denis Goulet, chief information officer at the New Hampshire Department of Information Technology. In addition to Goulet, Diana Kelley, executive security advisor for IBM Security, and Todd Waskelis, vice president of AT&T Security Solutions, gave talks at the symposium. “We wanted high impact speakers, and we were extremely fortunate to have three distinguished cybersecurity leaders come and speak,” said Gwebu. 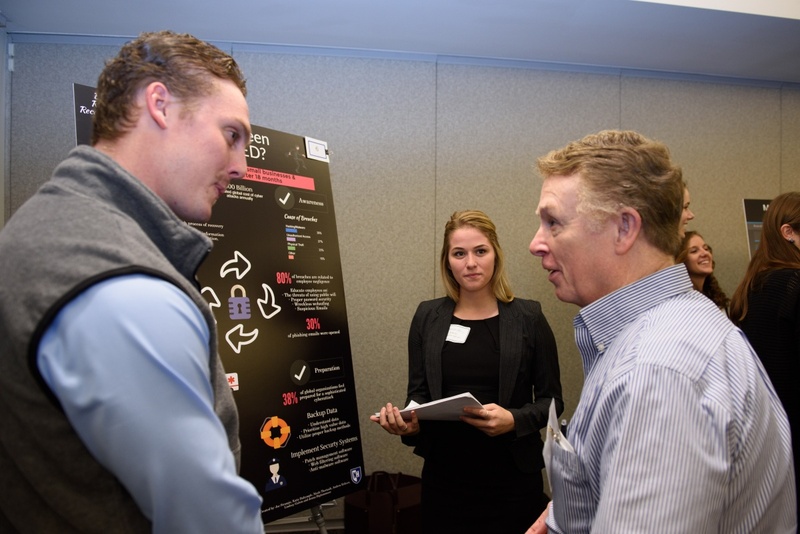 Business Administration students Andrew Eriksen '17 and Jenna Digiantommaso '17 talk to a small business owner about steps to take after a cybersecurity breach during the Cybersecurity Symposium poster session. Gwebu and Wang's students were invited to attend the symposium, and students in two information systems classes created research posters about common information security topics and presented them to attendees. The students also created a website with videos and resources for symposium-goers. “It was rewarding seeing our students using the knowledge they had gained in the classroom to make a meaningful difference in our local business community,” said Wang. The first year of the symposium was a success, with 30 businesses and nearly 100 students attending. Gwebu and Wang hope to make it an annual event. “We have a great opportunity through Paul College to have an impact on small businesses in the state, and we want to take advantage of that,” Gwebu said.